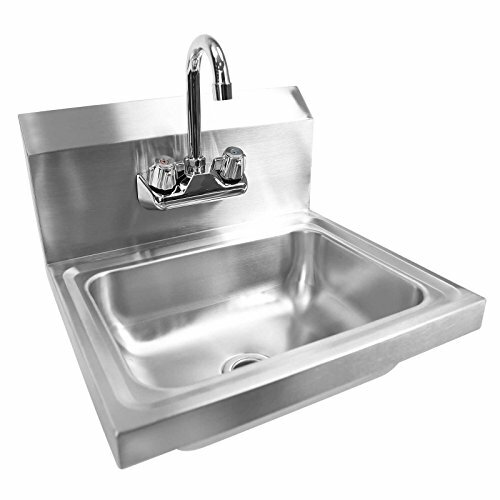 This heavy-duty wall-mount sink by Gridmann is constructed from 18-gauge #304 stainless-steel, and is the perfect hand sink for use in a kitchen, bar, restaurant, laundry, school, hospital, hotel, park, or any other commercial setting. It is NSF certified to meet strict standards for public health protection and built for high-volume use to last a lifetime. This basin features a large bowl size with plenty of room for hand washing, and a pre-drilled 7-5/8â€ tall backsplash to accept the included gooseneck chrome faucet. It also has a wall mount bracket for easy installation (screws/anchors required for installation and not included), a 1/2" wide drip channel surrounding the bowl, a stainless-steel basket strainer, and an attractive honed finish. Fast and easy assembly. Overall Size: 17â€ wide, 15-1/2â€ front to back, 17-5/8â€ overall height (including faucet & drain). Bowl Size: 14â€ x 10â€, 5â€ deep. Faucet mounting holes: 4â€ on-center. Faucet connection: Standard 1/2â€ male pipe thread. Spout clearance: 13-1/2â€ from bowl bottom (to bottom edge of spout). Drain connection: Made to fit a standard 1-1/2â€ tailpiece/trap. Includes: Basin with attached backsplash, gooseneck faucet, basket strainer drain (trap not included), and wall mount bracket.